Jokes beamed directly to your eyeballs. People would be happier if they watched more stand up comedy. That's a proven fact by scientists. Having once been a lowly comic trolling for laughs through the streets of New York City, I rarely saw people walking out of a club with a frown on their face - unless Daniel Tosh was performing. So the idea of bringing more stand up comedy to the masses would increase the world happiness index by at least 42 percent. 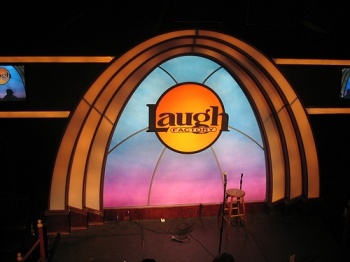 Luckily, Sony unveiled a new video service for the PS3 in cooperation with the Laugh Factory comedy club in Hollywood which will do exactly that. Starting on September 1st, you can download the Laugh Factory LIVE application and watch video of stand ups spewing mind sauce into a microphone. In addition to classic older performances, you'll apparently also have access to live feeds from the club. All the comedy is free until December 2012, but after that it will only cost $3 per month. Depending on how much video is available, that's not a bad deal. The announcement lists Dave Chappelle and Dane Cook as recent performers at the Laugh Factory in California who would be featured in the application, but I think the real fun of Laugh Factory Live will be laughing at comics who haven't "made it" yet. The men and women doing comedy for the pure joy of making others laugh deserve an audience, and broadcasting that around the world to PS3s everywhere is a great opportunity. And hey, maybe you'll get to see the next Carrot Top before he gets all buff.